November 13: Attack on Paris covers an infamous and sad day in recent French history. Paris was preparing for an international soccer match to be held on November 13, 2015. In an instant, everything was changed by a well-coordinated series of terror attacks that struck at the very core of the French way of life. The soccer match between France and Germany had jammed 80,000 people into Le Stade de Paris. Suddenly, a huge explosion rocks the stadium, followed shortly by a second one, and this becomes a Friday the 13ththat will be indelibly imprinted on the hearts and minds of the French people. Brothers Jules and Gedeon Naudet had already produced the award-winning documentary 9/11 and its successful follow-up film 9/11:10 Years Later. They now bring their considerable skills to focus on the searing events that are the subject of this three-episode mini-series blending actual news footage with interviews of survivors, police, firemen, and politicians who become the dramatis personae of November 13: Attack on Paris. 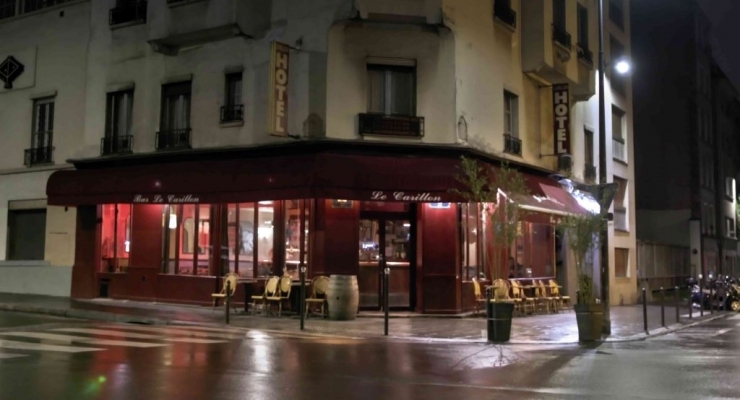 Following the soccer stadium attack that found French President Francois Hollande as one of the many spectators hurriedly evacuated to safety, there was a second wave of attacks minutes later in four popular restaurants in the 10thand 11tharrondissements. Witnesses give their harrowing personal stories of the events that were unfolding in rapid succession. A patron who was in the Comptoir Voltaire café that night describes his close encounter with a suicide bomber who had just detonated his explosive vest. Further evidence showing the aftermath of these attacks comes from on-location smartphone videos that deliver absolutely chilling images of death and destruction. Firemen are summoned to the various scenes and we next get their first responder accounts of the restaurant shootings. The legendary music establishment, Bataclan, features the American band, ironically named Eagles of Death Metal, playing to a packed house. When it became clear that the explosions heard by the crowd are gunfire, not part of the stage act, there was wholesale panic. While most of the attendees managed to escape, a small group of survivors were held hostage by two men who were heavily armed and wearing explosive vests. As negotiations with the terrorists drag on, Minister of the Interior Cazeneuve, President Hollande, Chief Momly, and Paris mayor Anne Hidalgo weigh the limited options available to them. The Brigade of Research and Intervention (BRI) and the French equivalent of a SWAT team, RAID (Recherche, Assistance, Intervention, Dissuasion), eventually launch an assault on the Bataclan that is over in just three minutes. Les Frères Naudet make use of a time clock on the screen that demonstrates how rapidly these attacks proceeded as well as the courageous responses of the Parisian firemen and police. The interviews with a number of the Friday the 13th survivors put human faces and emotions on tragedies of that day. Although these sessions were recorded more than two years later, nearly all of those interviewed were still suffering from occasional flashbacks, bouts of melancholy, and other symptoms of post-traumatic stress disorder. 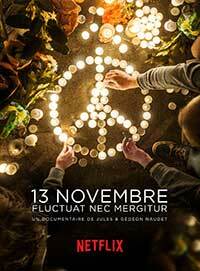 November 13: Attack on Paris is a documentary that is every bit as good as its 9/11 predecessor and a fitting testimonial to the strength of the human spirit. In the end, this show’s creators leave us with expressions of optimism and resoluteness in the wake of unspeakable horror: l’amour vaincra (love will win) and the old Parisian motto fluctuat nec mergitur (tossed by the waves but it does not sink). Highly recommended. A tense retelling of the November 13, 2015 terror attacks that rocked Paris for several hours as seen through the eyes of survivors, response teams, and police.